I opened my hotel window to some morning drizzle and a sea of umbrellas passing by down below. 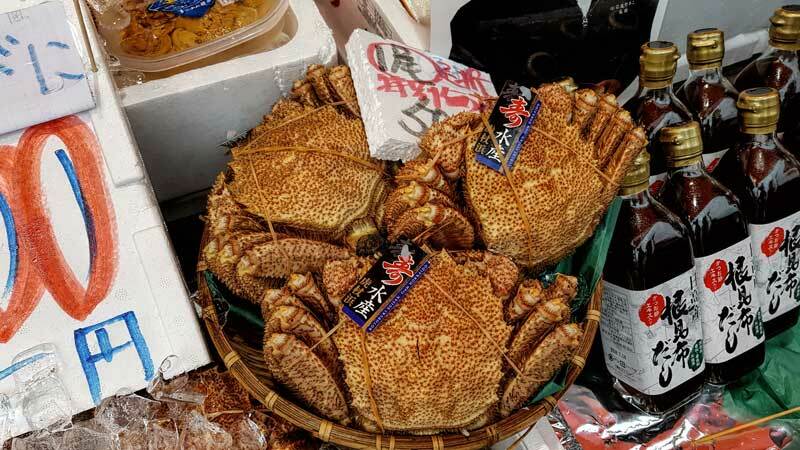 We only had 24 hours in Hakodate and the number one item on my agenda, like any enthusiastic foodie, was the Hakodate morning market located down near the bay. A good portion of the market is under cover making it a good option for this morning with the forecast expected to clear in a few hours allowing some time for exploring outdoors. The market is literally a two-minute walk from the Four Points by Sheraton hotel where I’m staying or the Hakodate train station. It’s a very compact city and easy to explore on foot. It’s also only a few minutes to the bay where you can walk along the front exploring this area including the distinct red brick warehouse district and continue on up to the historic Motomachi area. 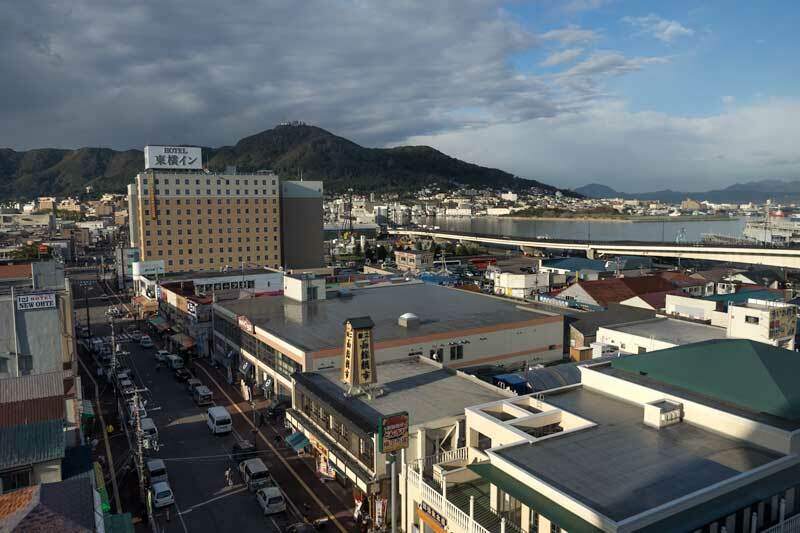 Even to the lower Mount Hakodate ropeway station on the hills in the distance is barely 2 km from the hotel. It’s well worth a trip to the top of that mountain for fabulous views out along the peninsula. Like Aomori at the north of Honshu island, Hakodate is an ideal stopover if you’re planning to travel between Tokyo (or other southern cities) and Sapporo on the Northern Island of Hokkaido. 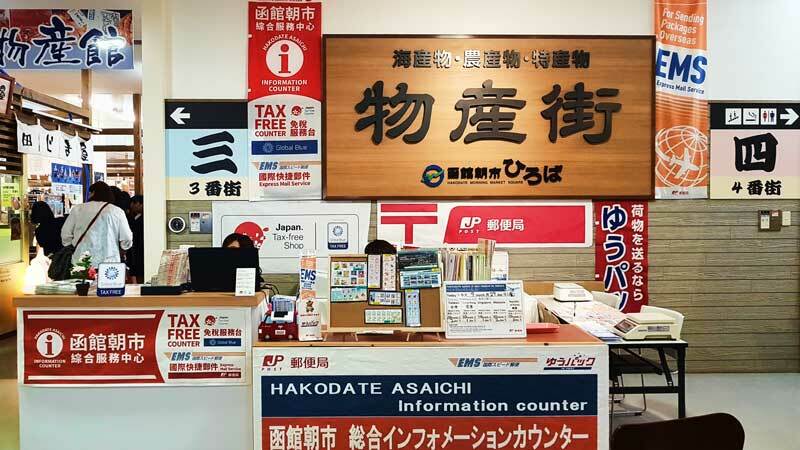 The bullet train makes this travel practical and together with the Japan Rail Pass, touring off the typical tourist trail in Japan can be surprisingly affordable. 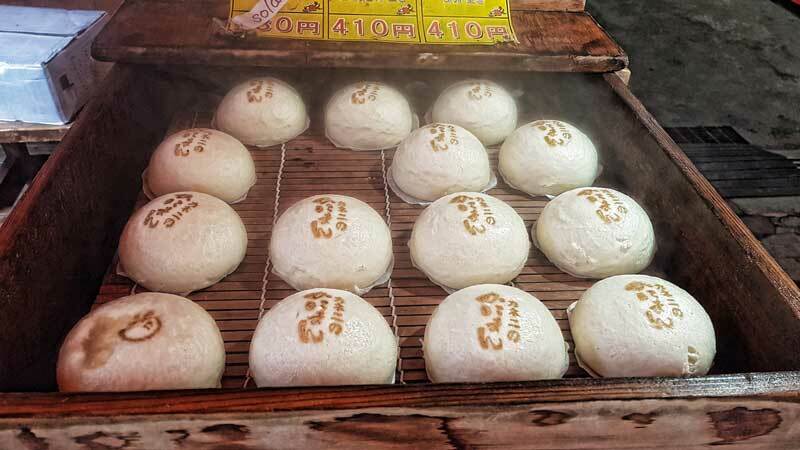 While the Hakodate Morning Market is actually open into the afternoon I’d highly recommend getting up early and skipping your usual breakfast to enjoy the bustling morning atmosphere and select your morning meal from among the many delicious options on offer. It’s a food market so it would be a shame to spoil your appetite eating before you get there. Market stall holders keep their own schedule with the majority of stalls open from around 5 am until 2 pm but as with most markets, a lot of the action happens early. 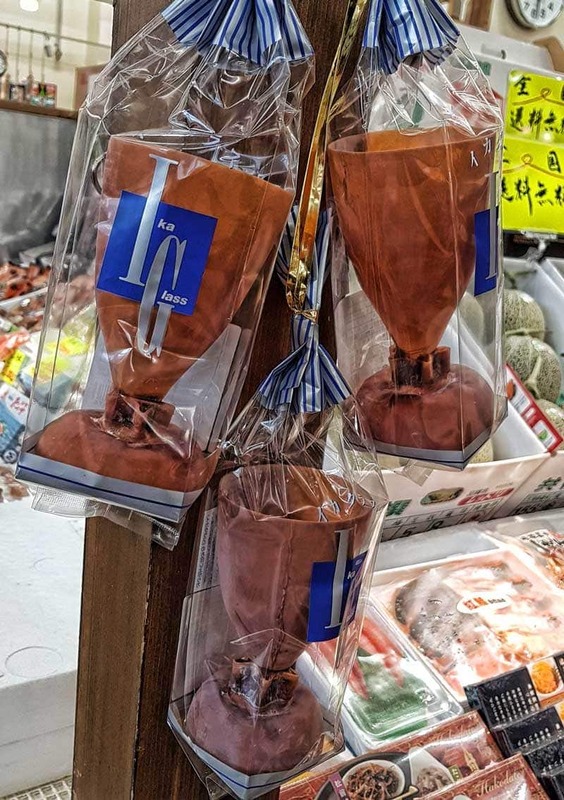 We’ve enjoyed many food markets in Japan, from the historic Nishiki market in Kyoto to the bustling Tsukiji market in Tokyo, the friendly Omi-cho market in Kanazawa and who could skip over Kuromon Ichiba in Osaka, Japan’s kitchen. 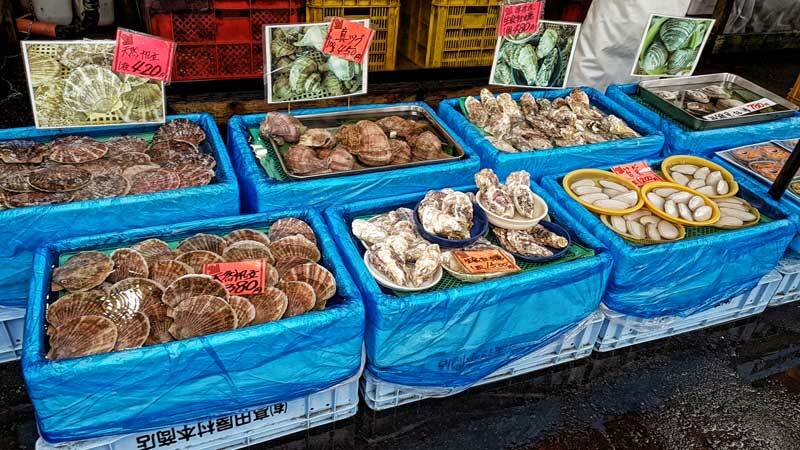 Each has their own energy and appeal and the Hakodate morning market is no exception. It’s easy to get distracted when you arrive with so much on display, it can be a sensory overload but I’d suggest finding your way to the Information Counter in the food court off Asaichi Odori Street. They speak English at the counter and will be able to give you a vendor map of the market in English that is well worth having as you explore. There are over 150 stores overall spread out across several buildings and the alleyways in between but they’re grouped by type so that makes it easier to find your way around and recognise where you’ve already been. There’s fresh and live seafood everywhere you look, squid, crabs and shellfish featuring more prominently than fish alongside a wide variety of different fruit and vegetables. 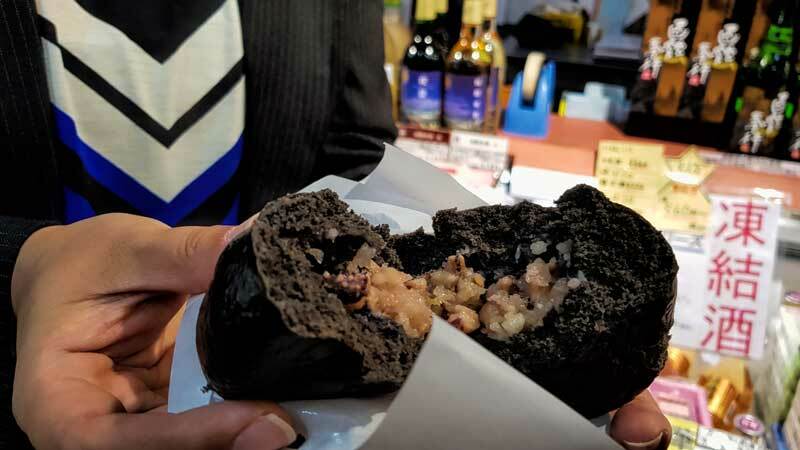 Inside the market I found ikaman, a version of the more familiar nikuman (meat bun) but it outer bun is unusual, it’s a deep black coloured naturally with squid ink and the bun itself is super soft. Inside is a filling of subtly seasoned squid and vegetables. Delicious! A perfect start to the morning’s tastings. The ikaman was so good that I couldn’t resist also trying the kaniman or crab bun when I saw them on offer later at one of the stalls outside. I was hoping to try hairy crab, a speciality up here but I was already too late and they’d run out. 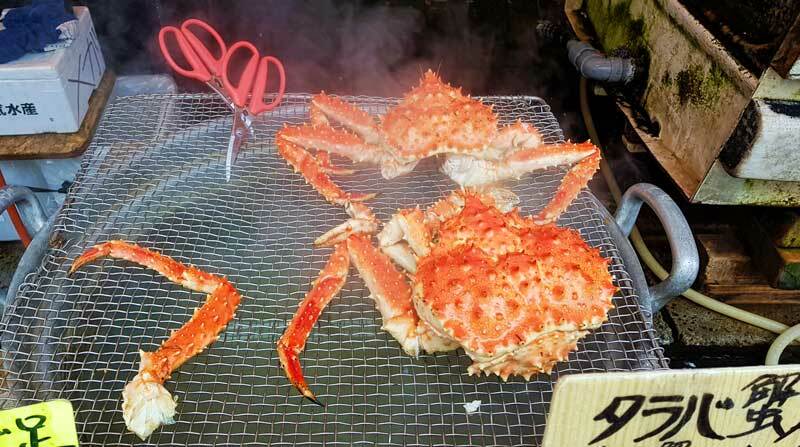 I went with snow crab which was in season and a delicious alternative. 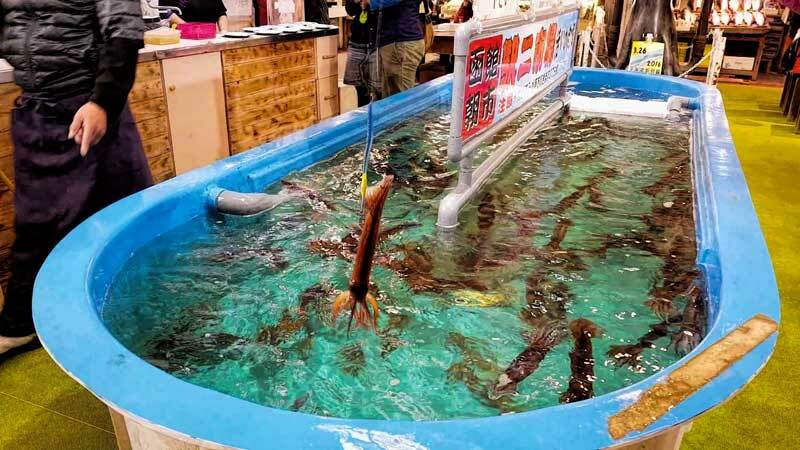 Squid is the primary catch up here in Hakodate and many restaurants in the city offer fresh squid sashimi but a unique market experience here is to catch your own from the tank and they will clean and prepare it for you while you watch. They have tables to sit and eat it there and then while it’s at its peak freshness. Look out for it in the indoor Ekini Market section, it’s interesting to watch even if you aren’t going to fish yourself. I didn’t get to try squid sashimi here but I did have some super fresh with grated ginger as part of my lunch later in the day at Sara no Tsuki near the Hakodate lower ropeway station. While it looks like you could reach in and grab one the technique for looping it around the hood is important. This reduces the stress on the squid and results in a better texture and flavour, you should also try to hook one that is nice and dark in colour, as they age they become more transparent and less sought after. The fruit and vegetable stalls were equally colourful and appealing. Japanese persimmon (kaki) are one of my favourite fruit so I couldn’t resist buying one to tuck into my bag for a juicy snack later in the day. We used to get them reasonably easily back in New Zealand but I rarely see them in the tropical parts of Australia so it was a bit of a treat I couldn’t resist. The unusual find of the day would have to be the ika glass, amber in colour and it really is made of dried squid (ika). An interesting concept. I guess when you’ve finished drinking for the evening there’s no need to wash up, you can just nibble on your glass. Another whole world of beer snacks are out there that I never knew existed. For a more traditional (and delicious) beer snack though I found that in one of the alleys outside. 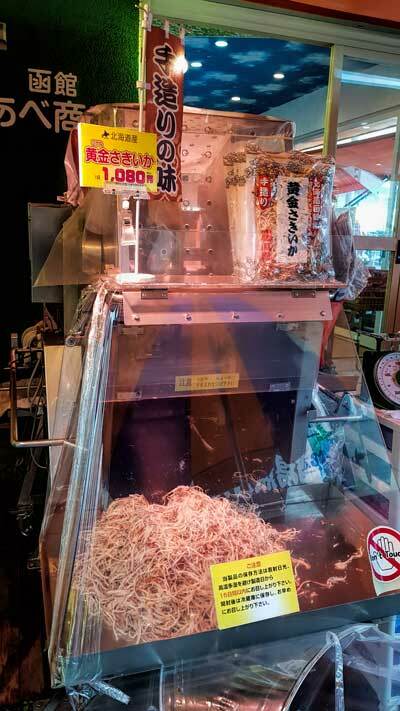 We got chatting to a woman who was operating something that seems to be a dried squid chipper, an invitation to give it a try sealed the deal. It’s delicious and I contemplated whether I’d get a giant bag of it back through Australian immigration, or if I’d eat it before the end of the flight home. While it’s a delicious and low-fat snack that would go particularly well with a pitcher of icy cold Sapporo it’s actually a very practical method of preservation. Life is busy everywhere and preparing fresh squid isn’t always possible or in season so the dried version is often used instead especially at home. It would make a fabulous dashi stock and can be readily rehydrated ensuring the local staple is available all year around. If by now you are starting to consider sitting down to breakfast you have two really good options. If you have a fancy for some hot food, and in the cooler weather it’s a very attractive choice, you can head up to level 2 where you can select from a range of options that will be grilled fresh in front of you. Alternatively down on the ground level you will find an interior alley of tiny restaurants with their little replica bowls from their menu in the window that offer some fabulous sushi, sashimi and donbori including Oyakudon. Now I’ll admit parent and child bowl is not the most attractive English interpretation, some things just aren’t meant to be translated but super fresh and glossy salmon sashimi and vibrant salty bubbles of roe are actually pretty hard to resist. Having been thoroughly visually and gastronomically satiated and with the sun starting to glimpse out from behind the clouds it’s time to head out into the day and discover the rest of what Hakodate has waiting. 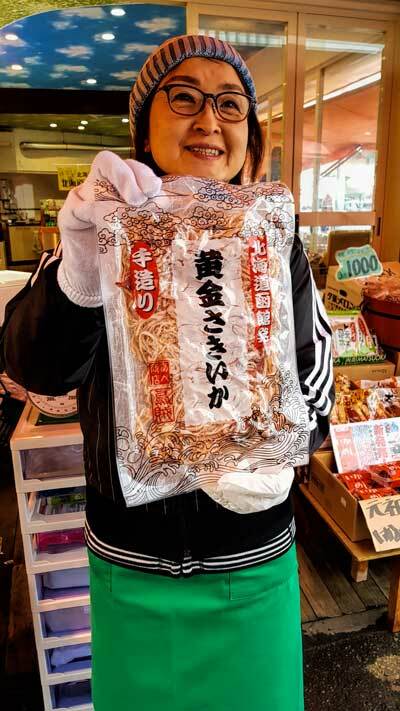 I’d thoroughly recommend having the markets on your itinerary if you’re staying in Hakodate. If you’re considering breaking your journey north for a few hours to stretch your legs it’s easy to do. Pop your cases in a locker at shin-Hakodate and take the 15-minute train trip into the city, it’s an easy city to explore.